John Templeton was born in the small town of Winchester, Tennessee in 1912. As a young man, he graduated first in his class from Yale University before earning a law degree as a Rhodes Scholar at Oxford University in England. Eventually he became a billionaire by popularizing globally-diversified mutual funds. Templeton started his own mutual-fund company in 1954. He sold his firm to Franklin Resources in 1992, which became known as Franklin Templeton Investments after the merger. Despite his wealth, he was a life-long proponent of thrift. I hadn't heard of Templeton until recently. He didn't live a flashy life, and he fell out of prominence long before I became interested in investing. The more I learn of him, however, the more his financial philosophy appeals to me. Like Warren Buffett, Templeton built his wealth by following investment fundamentals. If Templeton's advice sounds basic, that's because it is. Not even the world's most successful investors possess some magic secret. They stick to the fundamentals. They buy low and sell high, and they hold stocks for the long run. They're not in the market for a quick buck. They're willing to get rich slowly. There are 28 reader responses to "The Fundamental Rules of Investment Success". Too bad but interesting from a psychological perspective. Best quote I’ve read in a long time. An investor who has all the answers doesn’t even understand all the questions. One of the better quotes I have ever read…Templeton’s success has been outstanding. For whatever reason, many people don’t mention him in the same sentence as Buffett or Lynch but there is a lot to be learned from him. Sir John Templeton was also a great philanthropist. He just passed away in November of 2008, but his son continues his legacy of giving through the Templeton Foundation. The foundation website is: http://www.templeton.org if you’re interested in learning more about him or his giving. I think it’s something to keep in mind that many of the great investors and really wealthy people that we look to for their financial advice were or are also great givers. This is an example to follow as well as well. Because honestly, if there’s an investor that’s just building up wealth and not giving any away he’s (or she’s) probably not worth following anyway. Ah, the “boring” way to invest ;) I’ll take the boring way any day, though. Less stress, and the returns over time are more than enough for me. There is some great advice in this post that, unfortunately, many of us have lost sight of. So many investors believe that they can “beat” the market even though its been proven time and time again that conservative investing over time wins out. Again, great tips. I like Templeton’s advice regarding the changing landscape of investing. Even if you can come up with hard and fast investing maxims, you can’t control what’s going on in the rest of the world. Economic and political conditions effect markets in numerous ways at all, by creating instability risk, restricting the money supply, etc. Lots of good, sage advice from Templeton. A breath of fresh air after getting kicked in the balls for the last decade.. Let’s hope he is right that “This time it is NOT different”..
JD – great PDF! Templeton was and is right on the money. The great thing about truth is that it proves to be valid in all times! If you haven’t found them already you should check out the Motley Fool investment team (www.fool.com). They offer awesome “Foolish” advice. They claim its foolish because they don’t follow the Wall Street crowd. I’ve been following their Stock Advisor newsletter advice for many years and have seen awesome returns. In Oct 2008 I switched to the Motley Fool Pro service, a high end investment service with very discreet advice including areas like options, etc. Since I joined the market has declined 17% while I’ve seen my portfolio grow over 25% using their advice – not bad!! But you don’t have to pay the bucks for the service, there is tons of free stuff at their website. However, if you do decide to get into a paid newsletter or something like MF Pro you won’t be sorry, I’ve made back my investment many, many times over. Did he run around pushing buttons to make bells and whistles go off as he gave this advice? Maybe that’s why we don’t hear enough about this type of investing. Great advice. I’m going to do more research. Some good but some of this is dated. “When buying stocks, search for bargains among quality stocks.” This assumes you can identify bargains better than the rest of the investment population. Most data suggests you can’t (read Random Walk). A better list would include low fee broad index funds and an asset allocation plan of both stocks & bonds (perhaps others) where the portfolio is periodically rebalanced. Most of the time stock picking is a losers game. I recommend “The Four Pillars of Asset Allocation” by William Bernstein. Best investment book I’ve read among many. Thanks for the recommendation, Ben. I’ll check it out. That line caught my eye too. I’m no Warren Buffet. I am unequipped to pick a good stock and a bargain from the bad. I tried practicing with a virtual stock exchange, and it is definitely beyond my ability. Index or lifecycle funds are the best options for me. Successful investment managers spend enormous amounts of time trying to determine which are and not good stocks at bargain prices, and even at that, a random walk does just about as well as the average. For most of us who haven’t got that amount of time to spend — to say nothing of developing the expertise — index funds are the way to go. Even then, we need to know what “index” means in the context of a particular fund, since all funds don’t mean the same by the word “index”, but even more important is keeping an eye on expense ratios. A fund with low expenses will have a better net return than a fund with better performance but higher expenses. The short version of what I am adding to Templeton’s remarks is that making money is work, whether in one’s job or in one’s investments. The more one wants above average income, the more work it is. Off topic, but what do you do when you get tired of reading (or writing) about personal finance topics? Take a break? Would you come back to it after a break? Sites like GRS I think help me keep perspective and not lose sight of financial goals, but I feel like April is going to be full of posts on things I already know, or don’t know because I’m not interested in them. I’m tempted to switch my daily blog regimen over to something else, but I’m afraid I wouldn’t come back, and it might cost me my focus. Or, to put it another way, where could I find discussion on the less basic, more philosophical aspects of personal finance, especially during this ‘back to basics’ month? This has nothing to do with investing, I know. You know that I prefer to write about deeper issues that provoke reader conversation and debate. Posts like this one don’t offer a lot of chance for that. But that doesn’t mean financial literacy has to be just me lecturing and readers listening. I would love some suggestions about fundamental material that’s worthy of discussion. Hey J.D.! well, you asked … I know there is already a guy out there doing “Zen Habits,” and I haven’t read his stuff b/c there is only so much time in the day and frankly I like you … but something I’ve been grappling with lately is deepening my yoga practice. It helped me get through four really bitter years in a wretched work environment and, while I do not “hope” for eventual enlightenment, I do work for it. Enlightenment, according to the reading I have done, is the extinction of desire. It is freedom from the burden of wanting. Perhaps you could explore the notion of financial enlightenment? Tyler: You can try checking out my blog if you like. I like to think of it as ‘the next step up’ after you’ve cleared off debts, though I do offer some tips on how I cleared my debts. I do a little bit of philosophizing, and offer a few strategies for budget management that are a little more advanced than the basic excel spreadsheet. I find this part interesting because I’ve seen the same principles applied in business, golf, and football. The businesses and sportsmen who are successful are often people who have basic talent but supplement it with hard work at the basics. The business I am working for now does the basics of business well: They have a good product that meets a customer need, they make sales calls on prospective customers, they treat their customers fairly and well, they invest in new products and product improvements. Tiger Woods’ daily workout schedule was shown on NBC last weekend. The guy is obviously talented, but he also works at it 11-12 hours per day. Again, he works on the basics – nutrition, putting, lifting weights, and hitting balls. In football, I’ve seen my favorite local college team have one of the winningest records over the past five years. They recruit good players, lift weights, and practice the fundamentals: blocking, tackling, play execution, clock management. I’d also argue that you’re doing the same thing here at GRS – you write good articles, they’re proofread, you have a high publishing frequency, they’re interesting articles, and you have a nicely designed and laid out website. Many people want to think there’s a shortcut, or a trick, or a secret to building wealth, running a successful business, or playing a sport well. I think this article and the additional examples I mentioned show that it’s just diligently doing the basics well over a long period of time. Recognizing this can help a person both achieve success in their chosen endeavor as well as have a healthier attitude towards the process involved. If you’re looking for a topic to stimulate some debate, how about discussing the pros and cons of mutual funds. Many like the idea of having someone else manage their money for them, especially if they are just starting to invest. However, mutual funds are not cheap – you’re paying at least 1% per year for an actively managed equity fund. Index equity funds are less expensive, but also have their drawbacks, especially in markets like these, as you lose the possibility of earning above-market returns. I like both of these ideas, actually. John, I think your topic would make a fine little discussion of the pros and cons of various ways of investing in the stock market. Well worth exploring. I’ll see what I can come up with. I think you’ll find lots of helpful info for free. Yes investing is work – but if you want to make money it’s going to take some time. You can always hand over big money to a broker to underperform the market as over 80% of them do. Years ago I realized this and left my broker and have done MUCH better by doing it myself. How do I know, my brother stayed with the same broker and his performance is waaaaaayyyyy behind mine. But you have to work at it, spend time reading, studying and learning. However, that investment of time can be very rewarding! Good luck. Hey don’t you guys think that diversification needs to be better specified? I mean, in most cases someone with debt should prioritize paying it off rather than making retirement contributions. In a sense, not contributing more to the nest egg is the best investment strategy. Thoughts? 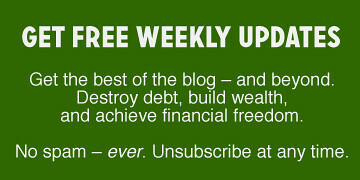 It would be disappointing if, for the month of April, my favorite PF Blog replaced mutual fund prospectuses I receive in the mail and sleeping pills as my nightly prescription for passing out. I can find various advice & philosophy, and on investing and basic personal finance anywhere on the internet. What I’m more interested in is how actual real individuals invested and totally transformed their lives through it. Mr. JD, please share your own stories of your personal lessons of investing. What some Wall Street fat cat did is meaningless to me. Please, inspire me, with what YOU have done, how YOU have transformed your life through investing. I offer this as constructive criticism, and I won’t be offended if you delete my comment if you think it is objectionable. Very good tips and advice, the problems in investing is people ignore the research detail and fall into wrong hope, and when it hits they get frustrated. Can’t go wrong with that advice. It’s easier said than done to follow the fundamentals of investing, but that’s pretty much the only sure way to be successful. It takes a lot of studying and discipline to become a profitable investor. Templeton was one of the icons of the investment world.